Long-distance hiking. The secret lives of whales. Life in the mountain town of Stehekin. Birds of the West. Inquisitive journeys around the world, from Galapagos to Antarctica. 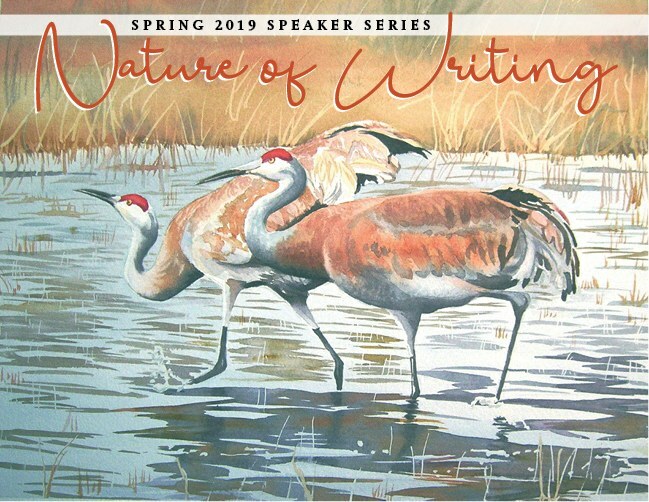 Join Village Books and North Cascades Institute in welcoming award-winning writers to Bellingham to share their latest works this Spring. From essays to art to memoir to natural history, you'll learn more about our wondrous planet through the voices of our country's most gifted nature interpreters. The New Livestock Farmer provides pasture-based production essentials for a wide range of animals, from common farm animals (cattle, poultry, pigs, sheep, and goats) to more exotic species (bison, rabbits, elk, and deer). This book is must reading for anyone who is serious about raising meat animals ethically and offers a clear, thorough, well-organized guide to a subject that will become increasingly important as the market demand for pasture-raised meat grows stronger. Rebecca Thistlethwaite runs Sustain Consulting, which specializes in food and farm issues, working with both nongovernmental organizations and for-profit businesses. She also operates a small farm and a community farm stand in Oregon with her husband and coauthor, Jim Dunlop, and their daughter, Fiona..
By age 25, Heather Anderson had hiked what is known as the “Triple Crown” of thru-hiking: the Appalachian Trail (AT), Pacific Crest Trail (PCT), and Continental Divide Trail (CDT)s—a combined distance of 7,900 miles with a vertical gain of more than one million feet. A few years later, she left her job, her marriage, and a dissatisfied life and walked back into those mountains. In her new memoir, Thirst: 2600 Miles to Home, Heather, whose trail name is “Anish,” conveys not only her athleticism and wilderness adventures, but also shares her distinct message of courage—her willingness to turn away from the predictability of a more traditional life in an effort to seek out what most fulfills her. Amid the rigors of the trail—pain, fear, loneliness, and dangers—she discovers the greater rewards of community and of self, conquering her doubts and building confidence. Ultimately, she realizes that records are merely a catalyst, giving her purpose, focus, and a goal to strive toward. In November 2018 Heather Anderson became the only woman to have completed a calendar year “Triple Crown” of thru-hiking in a single calendar year. In the process she set a female Fastest Known Time (FKT) for the route—hiking it in 251 days, 20 hours, 10 minutes and is the only female “Triple Triple Crowner” having completed the route three times. She holds the overall self-supported FKT on the Pacific Crest Trail (2013)—hiking it in 60 days, 17 hours, 12 minutes, breaking the previous men’s record by four days and becoming the first women to hold the overall record. She also holds the women’s self-supported FKTs on the Appalachian Trail (2015) with a time of 54 days, 7 hours, 48 minutes and the Arizona Trail (2016), which she completed in 19 days, 17 hours, 9 minutes. A resident of Bellingham, WA, Heather has hiked more than thirty thousand miles since 2003, including thirteen thru-hikes. An ultramarathon runner, she has completed six 100-mile races since August 2011 as well as dozens of 50 km and 50-mile events. She has attempted the infamous Barkley Marathons four times, starting a third loop once. Heather is also an avid mountaineer working on several ascent lists in the US and abroad. From the National Book Award-winning author of the classic book Arctic Dreams, a vivid, poetic, capacious work that recollects the travels around the world and the encounters–human, animal, and natural–that have shaped an extraordinary life. Taking us nearly from pole to pole–from modern megacities to some of the most remote regions on the earth–and across decades of lived experience, Barry Lopez, hailed by the Los Angeles Times Book Review as “one of our finest writers,” gives us his most far-ranging yet personal work to date, in a book that moves indelibly, immersively, through his travels to six regions of the world: from Western Oregon to the High Arctic; from the Galápagos to the Kenyan desert; from Botany Bay in Australia to finally, unforgettably, the ice shelves of Antarctica. As he takes us on these myriad travels, Lopez also probes the long history of humanity’s quests and explorations, including the prehistoric peoples who trekked across Skraeling Island in northern Canada, the colonialists who plundered Central Africa, an enlightenment-era Englishman who sailed the Pacific, a Native American emissary who found his way into isolationist Japan, and today’s ecotourists in the tropics. Throughout his journeys–to some of the hottest, coldest, and most desolate places on the globe–and via friendships he forges along the way with scientists, archaeologists, artists and local residents, Lopez searches for meaning and purpose in a broken world. In The Breath of a Whale, Leigh Calvez tells the story of orcas, blue whales, and other Pacific Ocean giants through the work of dedicated researchers who have spent decades tracking them along their secretive routes that extend for thousands of miles, gleaning their habits and sounds and distinguishing peculiarities. Leigh Calvez has worked with whales and dolphins as a scientist, naturalist, and nature writer. As a scientist, she was Research Director for the Ocean Mammal Institute. As a naturalist, Leigh has worked on whale watch boats in Massachusetts, Hawaii, and in the San Juan Islands of Washington State. Her first book is The Hidden Lives of Owls (Sasquatch Books), which was a 2016 Washington State Book Award finalist and a New York Times and Pacific Northwest Booksellers Association bestseller. For years, Ana Maria Spagna has stayed put in a small mountain valley. In Uplake she takes road trips, flies to distant cities, and returns home to muse on rootedness, ambition, wonder, and love. Uplake reminds us to love what we have while encouraging us to imagine what we want. Ana Maria Spagna lives in Stehekin, Washington, a remote community in the North Cascades accessible only by foot or boat. She is the author of several books about wilderness, civil rights, and life in a small community. Her writing has been recognized by the Society for Environmental Journalists, the Nautilus Book Awards, the River Teeth Nonfiction Prize, as a three-time finalist for the Washington State Book Award. Going Feral: Field Notes on Wonder and Wanderlust is the story of a human animal in search of her ecological niche. In these deeply personal and intellectually curious essays, Heather Durham explores wild America weaving the perspectives of trained ecologist, inquisitive philosopher, and restless nomad, probing intricacies of the natural world as profoundly as she does herself. Heather Durham is a nature essayist with a Master of Fine Arts in Creative Nonfiction and a Master of Science in Environmental Biology. She's held a variety of environmental jobs from state park ranger to restoration ecologist, field biologist to North Cascades Institute naturalist. She currently lives in the foothills of the Cascades where she works behind the scenes at Wilderness Awareness School. In Birds of the West, award-winning artist Molly Hashimoto captures nearly 100 Western bird species across seven habitats using different media, from quick ink sketches to vivid block prints. From the diminutive ruby-crowned kinglet to the majestic golden eagle, Molly’s range of art and detail encourages all of us, whether artists or not, to observe our feathered friends more closely. Seattle resident Molly Hashimoto leads plein air watercolor painting and printmaking workshops at the North Cascades Institute, Yellowstone Forever Institute, Wenatchee River Institute, and Sitka Center for Art and Ecology. Her artwork is widely published in cards, calendars, books, and journals, and she is the author of Colors of the West.